Recently, I was touring a facility with one of our clients. It's a colocation data center where companies can house their servers. Due to some new customers signing on and leasing space, they needed to add more capacity. That means more servers, which means more raised floor, cabling, cooling and especially, more power. So we were walking through aisles of servers, some of them cordoned off in metal cages to segregate them according to tenant, trying to get a handle on which areas were the most critical, which areas needed more capacity and which might have to wait. John (we'll call him John), has a limited budget, very little time, and must increase his capacity by 25% within 6 months, or these new contracts will fall through. Suddenly, John stops and points to a group of 5 server cabinets. "You see these? These are one of our oldest clients. They just leased 20 more cabinets that have to go in before the end of the month. That alone will put this UPS (Uninterruptible Power Supply) at its max. We won't have any more capacity in this half of the facility." I'm happy for him: "Well, that's a great problem to have!" "Yes, but they want to populate their new space in 2 months. If we sign on anyone else, we won't have anywhere to put them unless we get more power in here. As it stands, I might have to move some of our clients around to make space, and they won't like that." Thus, the purpose of my visit. "Ok, John. Can you show me where your other new clients are going to go in?" As we walked the data hall to the other side of the large building, where there was still some available real estate, John began pointing out other tenants' servers. Part tour guide and partly thinking out loud, John mumbled: "Ok, these here, these are some of our best clients; can't move them." We turned the corner. I was lost in a maze of Power Distribution Units, servers with red and green lights and a vast network of cabling. "We might have some space here. No. No, these servers are for an insurance company; they're too important." "I think I have some extra capacity on this electrical bus, I could afford to put about 30kW of servers here. No, wait. I need the extra space when client XYZ expands next year." I interrupt John: "Well, it seems like you're pretty maxed out as it is, and due to recent growth, you simply need to expand. Unless you can list out your most critical clients and somehow find room for them, you may need a new UPS." "That's just it," he replies "They're all critical." And I knew exactly what he meant. This is the data center industry, where each second of downtime is extremely costly. How does one prioritize customers? How do project managers figure out which projects need to happen first, and which can wait? When everything seems urgent, where do you begin? In a recent post about banning the term "mission critical", I wrote about the overuse of the phrase. It seems like everyone works in the mission critical industry these days, and every facility, every system, is mission critical. In an effort to bring a little sanity (at least in my own mind) to the issue, I wondered what a manager should do to determine exactly which systems and projects truly qualify as mission critical. And, can we figure this out in such a way as to be useful to a project manager in a very practical way? Now, there are complete college degree programs for project management, and I respect the professionals who have those qualifications. But project management is a skill that so many of us need these days, yet few of us have the official training needed to stay afloat in a world of deadlines and work orders. There must be a simple way for the rest of us to effectively manage projects, and in so doing, figure out exactly what is "mission critical." So you think you have some major deadlines to contend with? Feel like you can't stand the pressure? Let's rewind 70+ years back to World War II, and see how they handled pressure. Specifically, let's look at Dwight Eisenhower. You know, 'ol Ike: Chief of Staff of the Army, President of the United States, Governor of Occupied Germany, Supreme Allied Commander Europe (how impressive!). But as impressive as those qualifications are, none of them would have been possible but for the most important title of all: professional manager. Ike Eisenhour was able to manage millions of people, machines, media channels and supply lines effectively, all without the use of any fancy project management software, or collaboration technology like email or CRMs. And Ike was effective... we won the war, didn't we?! How was Eisenhower able to accomplish so much? 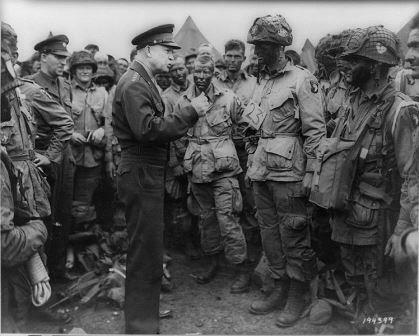 How did he manage such a large organization, and still find time to inspire the troops (as seen above, talking to troops during D-Day)? Eisenhower was able to distill all the noise down to discreet signals. He was able to filter what was important and what was urgent, or both. 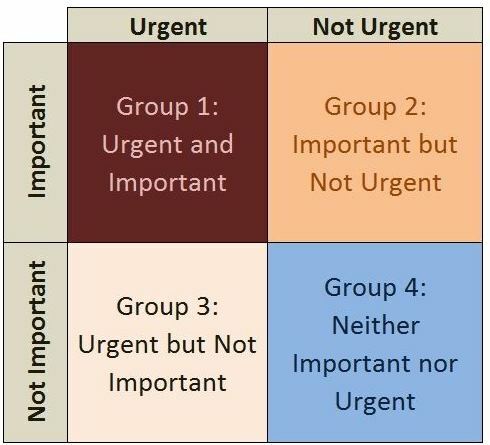 Although more recently attributed to Stephen R. Covey, Eisenhower was probably the originator of the "important-urgent" matrix, more commonly called the Eisenhower Matrix. Stephen R. Covey is the author of many great management and empowerment books, perhaps most notably the seminal work The 7 Habits of Highly Effective People: Powerful Lessons in Personal Change . But the matrix traces its roots back to Eisenhower, and I admit, there's a certain appeal to imagining the intelligent and tenacious General using it as a mental checklist on his way to Allied Victory in the dark days of WWII. The Eisenhower Matrix is a simple "go/no-go" method of determining if a task needs to be addressed right away. It is based off of Eisenhower's "urgent vs. important" criteria. In this method, items are determined to be urgent or not urgent, and important or not important. 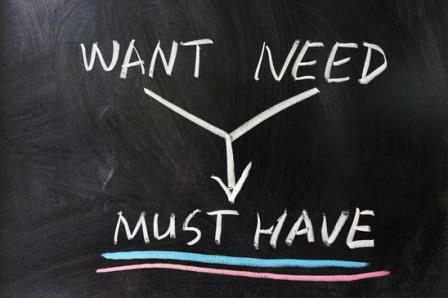 Or, as Dwight Eisenhower himself put it: "What is important is seldom urgent and what is urgent is seldom important." There are many ways to prioritize tasks for more effective project management, and this is but one method. It establishes two categories, important and urgent, and creates a matrix with them. Project management is a much more complex field than this, but the Eisenhower Matrix can simplify and expedite your decision making. It can help you get moving and something productive done, instead of getting stuck in analysis paralysis. So how could this help John, our friendly data center manager? Well, it won't magically create an excess of data center floor space or add 1200 Amps of electrical capacity, but it would easily show that his best customer who is expanding by 20 more servers this month is important AND urgent. It would show that the future contracts coming in 6 months are important, but not urgent, as 6 months is plenty of time to procure, install and commission a new UPS system (if he acts soon). Perhaps most importantly, it could quickly bring some order to this project manager's otherwise hectic day. If it's good enough for Dwight Eisenhower, it's good enough for me!